The Maya civilization existed for over 1500 years. During that time the Maya created many works of art. The art of the Maya was heavily influenced by their religion as well as other cultures such as the Olmecs and the Toltecs. The subject for much of their artwork was the Maya kings who wanted to make sure they were remembered throughout history. The Maya are perhaps most famous for their work in stone. They built many monumental structures including tall pyramids and palaces. They also made a lot of sculptures out of stone. One popular type of Maya sculpture was the stela. A stela was a large tall stone slab covered with carvings and writing. The stela was popular during the Classic Maya period when most major cities had stela built in honor of their kings. Stela were often located near altars. Some stelae were very large. The largest Maya stela discovered to date is the Stela E from the city of Quirigua. It weighs 65 tons and is around 34 feet tall. 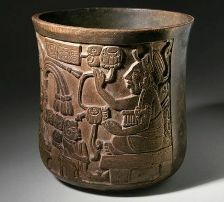 The Maya also created detailed carvings in other materials such as wood and jade. Although only a few wood carvings have survived, archeologists believe that wood carvings were very popular pieces of art for the Maya. 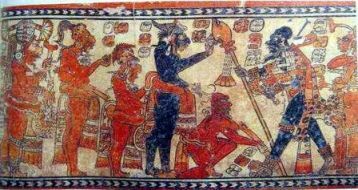 The Maya painted murals on the walls of their buildings including their houses, temples, and public buildings. The subjects of the murals varied widely including scenes from daily life, mythology, battles, and religious ceremonies. Unfortunately, due to the high humidity of the region, few of the murals have survived. Maya ceramics are an important art form. The Maya created their pottery without the use of a potter's wheel. They decorated their pottery with elaborate designs and scenes. Archeologists are able to learn a lot about different periods and cities of the Maya through the scenes painted or carved into their pottery. Maya art can also be viewed in their books or codices. These books are made from long folded sheets of leather or bark paper. The writing uses a number of symbols and pictures and the books can be considered delicate works of art. Although none of the materials from the Maya age have survived to this time, archeologists can tell through the paintings, writings, and carvings the type of clothes that the Maya created. Clothing for the nobles was truly an art form. The nobles wore decorated clothing and huge headdresses made from feathers. Some of the most respected craftsmen were those that wove the detailed feathered clothing for the nobility. Unlike many ancient civilizations, Maya artists sometimes signed their work. Other arts included the performing arts of dance and music. The Maya had a variety of musical instruments including wind instruments, drums, and rattles. Some of the more complex instruments were reserved for the elite. The Maya used stucco plaster to create large masks and portraits of both the gods and the kings. The kings would often commission a work of art to commemorate events in their lives. The city of Palenque is often considered the artistic capital of the Maya civilization. It wasn't a big or powerful city, but some of the finest Maya art has been found within this city.